Home » What is Skim Coating? What is Skim Coating? Also known as a Level 5 Drywall Finish. In this video I’m going to take an in-depth look at the technique of skim coating. I get a lot of questions on all of my skim coating videos when should I apply skim coat? how do I mix the skim coating mud? how do I apply a skim coat to my walls or ceilings? I even get comments from fellow drywaller’s that skim coating is stupid! I’m going to try and clear all this up today in this what is skim coating video. Yes, skim coating new drywall sometimes is a good idea too. Skim coating isn’t always required for new drywall. but if there’s not going to be a texture I recommend it. It’s best to throw it then skim coat over all of the new drywall and tape joints all at one time. That way you have a uniform surface to prime and paint. Sometimes when you don’t skim coat you can see where the paint absorbs differently into the joint compound and drywall paper leaving the tape joints very visible especially with paint that has a sheen semi gloss or gloss paints. This is called flashing for photographing. Flashing often happens when a lot of natural light is in a room or by a South facing window. Skim coating is a great way to make all the walls new again. Skim coat is a thin coat of joint compound also known as mud. You can do a skim coat to smooth out damaged walls with. 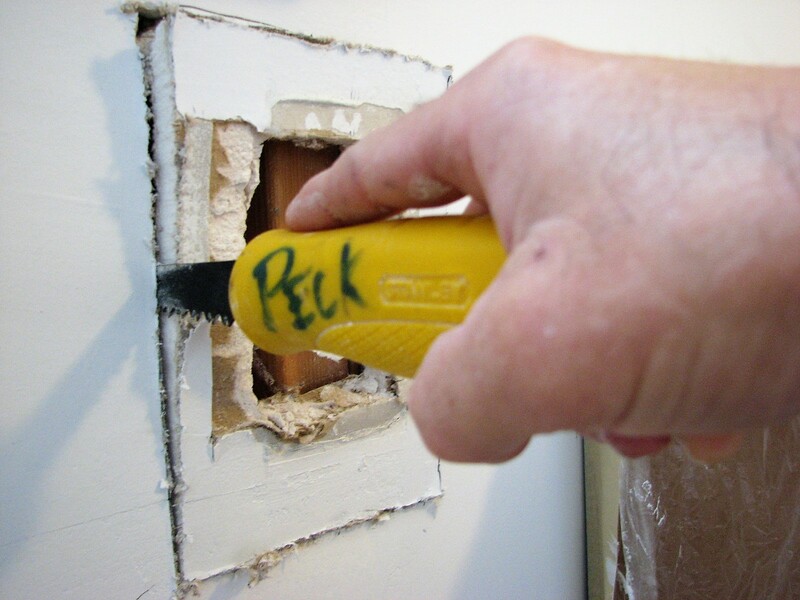 You might need to skim coat if you’re repairing after wallpaper removal, after drywall repairs or ceiling repairs, or even if your walls are just doing the damage from every day where in tear from your family. In general you have to apply at least two skim coats to achieve a smooth surface. Spread of skim coat on with the trowel or drywall knife over a rough wall or ceiling to create a flat surface for painting or re-texturing. I’m also going to show you how to mix skim coat mud. So stick around because I’ll showing four you some examples of when I skim coat a level 5 drywall finish. On this first skim coating project example, I skim coat after wallpaper removal. First I applied a Gardz problem surface sealer and then skim coated two rounds. The next skimming project was a water damage to ceiling repair. It was in a small bathroom so I skim coated the entire ceiling to have a uniform knockdown texture. Next skim coating project was a floor to ceiling 1980s style wall mirror that I had removed. All the black mirror mastic was still left on the wall. So I scraped it off with the chisel applied the Gardz problem surface sealer and two skim coats of joint compound to get the smooth finish. Lastly, I show you my Super Secret Skim Coating Paint Roller Trick! Hahaha… it’s my most popular video on YouTube! What is a skim coat? differences in surface porosity, and create a more uniform surface to which the final decoration can be applied. described in the foregoing text as being “trowel applied” with the intent being that the consistency (viscosity) of the joint compound be such that it can be applied by a trowel. Other tools may be used for application so long as the trowel consistency is achieved. The objective of the application is to achieve total coverage of the entire surface with the skim coat. This is typicaly accomplished by delivering the compound to the surface and using a drywall broad knife to force the compound into the surface pores and imperfections while shearing off excess compound from the surface. Apply a skim coat joint compound to wall or ceiling surfaces that will be subjected to severe natural or artificial side-lighting. Apply a thin skim coat of joint compound or a material manufactured especially for this purpose to the entire surface of the board. Apply a high quality latex primer/sealer compatible with the finish product prior to decoration. Remove and repair all surface irregularities and sand or sponge the joint treatment surfaces as necessary. Apply a thin skim coat of joint compound or a material manufactured especially for this purpose to the entire surface of the board. This will minimize any suction, porosity, or other variations between the joint compound and the face paper surfaces. Take care to eliminate laps or tool marks during the skim coating operation. Lightly sand or sponge wall or ceiling surfaces wherever necessary to ensure a smooth and even surface. Apply a high quality latex primer/sealer compatible with the finish product prior to decoration. Here’s my last video: How to repair your cracked drywall ceiling with this trick | So that crack never comes back!